See also Sevenpins by Lord Nightmare, Sevenpins LA34 by Lord Nightmare. Info: Created on 10th November 2011 . Last edited on 20th August 2015. Very nice. Do you think you will add diacritics as well? Perhaps. I'm looking for more dot matrix printouts to get more ideas, there is still some stuff about certain characters I don't like. I may do diacritics after that. This is quite terrific. Can you share if this is from a particular printer, or what printout sources you are using? Might I suggest widening the I and J like so? 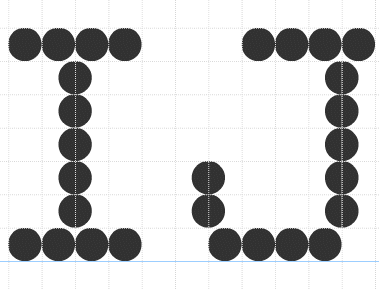 At the very least, the I will match the Z at 4 dots wide, and the bottom curve of the J looks a tad narrow. Love the 6 and 9 with the straight stems - wish I had used them in my Dot Matrix fonts. 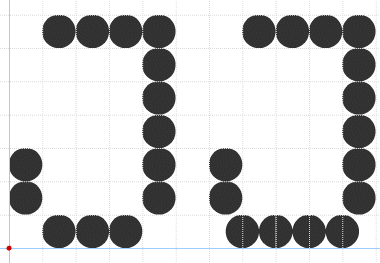 I actually JUST widened the Z to 5 dots wide, but I can easily undo that. No, that's fine, too! I just didn't want to mess-up the design of your Z. Moving from 5 dots wide may not allow for a sleek diagonal like you have with at 4 dots wide. Wow. I cannot type today. 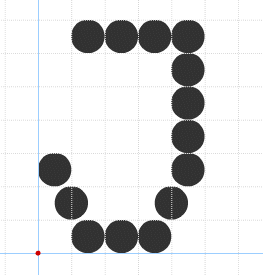 I meant to say: "Moving to 5 dots wide may not allow for a sleek diagonal like you have at 4 dots wide." The 'I' I'm planning to widen (as well as the bottom of the lowercase 'i'), but the 'J' cannot be as wide as your image: the widest a character is 'allowed' to be is 5 dots or 10 halfdots. Your example is 11 halfdots wide. You are exactly right; sorry about that. How about something like this?